Thank you to Carol Fong for her ongoing assistance in the office. Thank you to Alan Kleinschmidt and the San Francisco Choral Society for complimentary tickets for our staff, board & volunteers to their wonderful performances. 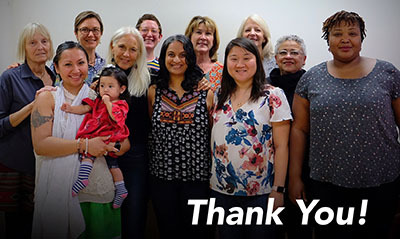 Thank you to Megan Blattspieler, Cat Brennan, Joyce Bichler, Sahru Keiser, Julie Goldman, Abigail Arons, Karen Klein, Peggy Huston, and Yamini Ranchod for their invaluable help getting our mailings out on time. Special Thanks to Angela & Sam Schillace, Debra and Andrew Rachleff, and Laure Woods for matching all donations made to the Stop the Epidemic Fund. Thank you to our powerful event speaker, Julie Morgan. Many thanks to the Karen Tate Community Hall at the Windmill School and LaureL Education Center for their hospitality. And a very special thank you to JoAnn Loulan who has championed such loyal support for Breast Cancer Action!